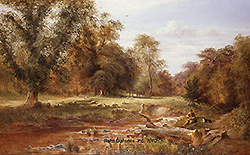 The English landscape was his specialty – depicting views of the Thames and scenes in Wales and Scotland. 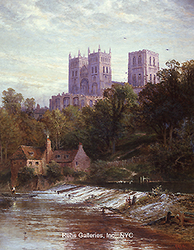 These works often featured small figures by the riverside or swans on the water. Light comes from outside the picture, filtering its way through a beautiful blue and white sky and casts soft shadows in the water. His landscapes are filled with subtle shades of color and the water often cuts across the canvas and vanishes around a turn in the background. 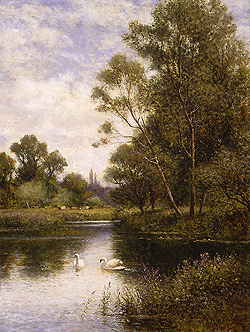 Alfred Glendening continued to exhibit in London through 1903 – showing more than 130 works in all.